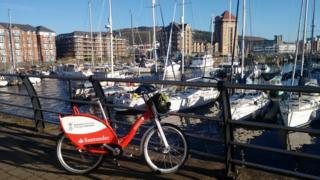 A new "Boris bikes"-type scheme will be launched in Swansea, after its university beat 22 others to raise £100,000. Five finalists had been crowdfunding to win the Santander competition, with Swansea getting 50% more pledges than nearest rival Brunel University London. Initially, the new cycle hire scheme will see 50 bikes placed at five hubs along the city's main cycle path. Swansea university will work with the council to develop the initiative. The bike hubs will be located at Singleton Park Campus, the Civic Centre, the National Waterfront Museum, Fabian Way Park and Ride and the Bay Campus. Santander Cycles are popularly known as Boris Bikes, after Boris Johnson who was the Mayor of London when the public hire scheme was launched in the city seven years ago. The scheme has since grown to have 800 docking stations, 11,500 bikes, with up to one million people using it each month. Swansea will now follow other cities such as Manchester in launching its own initiative. The university's vice chancellor Prof Richard Davies said the success demonstrates its "boldness, ambition and can do attitude" and it will work with the local authority to develop the scheme. Swansea council's cabinet member for environment services Mark Thomas added: "We have invested heavily in recent years, including upgrading links between the city centre and the new Swansea Bay Campus. "This work will continue so that cycling can help us achieve our aims of lowering car congestion." Swansea had battled Birmingham, Brunel University London, Surrey and Portsmouth in the final. The aim had been to raise the highest amount above its target to secure £100,000 of equipment and infrastructure to establish the bikeshare scheme for its community. Swansea's final amount dwarfed its target of £53,178 and it had 612 people pledging to help its cause.